The words just came—verse by verse, page by page—until And So You Were Born was, itself, born . . .
And So You Were Born is founded on the belief that a positive future begins with the education of children today. Written by Mona Parsa, the underlying motivation behind the work is the passion for promoting creation of a world in which tolerance and understanding prevail. This vision of the future will best flourish with a learned class of citizens—which begins with our younger generations today. 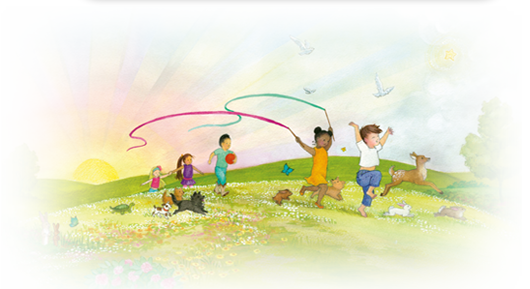 The book's principles were brought to life with the illustrations of Nidra N. Kilmer, who creates magical, multicultural, and inspired art for children. Nidra spends her time in America and overseas teaching free art workshops for kids, using art as a means to nourish within their hearts a love for their heritage. With the onset of new forms of delivery of stories and books,Twin Peacocks Publishing has initially made And So You Were Born available on these new platforms of reading, bringing the book to life on the iPad, iPhone and iPod Touch for the enjoyment of all alike—thanks to the brilliant skills in animation and interactive effects of one of the top digital development companies in Greece, Top Creations—allowing children to interact with the text, message and characters… wherever they are, whenever they’d like. **Coming to print this winter! Copyright © Twin Peacocks Publishing. All Rights Reserved.